If confirmed, this would be a big blow to the Australian Opals basketball team. 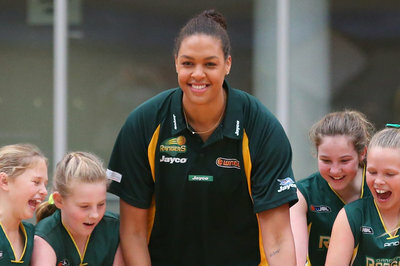 Team Australia center Liz Cambage suffered a leg injury during Friday’s 72-66 loss to the USA Basketball women’s national team, which was a tune-up for the FIBA World Championships in Turkey. However, the injury may be serious, because it is suspected that she may have tore her Achilles tendon in that game, per Roy Ward of the Sydney Morning Herald. In the report, Cambage felt pain in her Achilles and was scheduled to have scans sometime Saturday. There have been some unconfirmed French reports which did state that she did tear her Achilles, but Basketball Australia has not said anything to confirm or deny that. I would have like to have seen her out there, because we need to be challenged in that area. Our big guys need to be challenged. That’s an area where we’re obviously concerned. There are a lot of really good post players that aren’t here, size-wise anyway. The ones that are here are so young, they really don’t have the kind experience that they need, playing against these kinds of players. So, yes it’s unfortunate. I hope she’s okay. There’s nobody like her. Brittney Griner’s big. Brittney Griner’s tall. This girl is tall (with emphasis), and she’s big (with emphasis) and that’s a deadly combination. At the time, we didn’t really know the possible extent of her injury so we didn’t think too much of it at the time. But the news from the Sydney Morning Herald does change things. If Cambage did tear her Achilles, it would be a blow to the Opals’ FIBA World Championship hopes. This is even with Penny Taylor and Erin Phillips reporting late to the team after winning a WNBA championship with the Phoenix Mercury. Then, this is also a blow to the Tulsa Shock, the WNBA team that holds Cambage’s rights. I personally don’t see Cambage playing for the Shock again. But it still hurts their front office because this diminishes any trade value that she may have left. It also raises questions as to why the Shock haven’t traded her in the 2013-14 offseason, unless they tried to, but were unable to find a suitor. Stay tuned as we find out more on Cambage’s injury status.